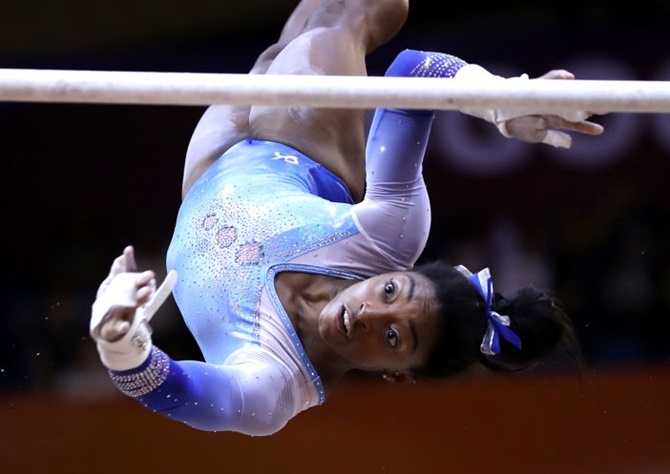 Rediff.com » Sports » She is the best gymnast we have ever seen! She is the best gymnast we have ever seen! Olympic champion Simone Biles became the all-time leading world gymnastics championship gold medal winner when the American claimed her third gold at the Doha championships on Friday. Biles's victory in the individual vault gave her 13 career gold medals, surpassing the record of Belarusian Vitaly Scherbo. Although suffering from kidney stone problems that briefly sent her to a hospital emergency room before the championships, Biles also claimed a silver medal in the uneven bars, won by Belgium's Nina Derwael. The 21-year-old became the first American to win a medal in every event during a world championship. She has won medals in each world championships she has competed in with 18 in total.